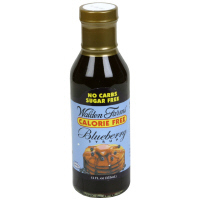 Walden Farms Pancake Syrup has always been our best selling syrup with hundreds of bottles sold to date. Where else will you find a pancake and chocolate syrup that is ZERO carbs, sugar, calories, and fat? Walden Farms Calorie Free specialties are endorsed by the American Diabetes Association. Blueberry Ingredients: Triple filtered purified water, blueberry flavor, natural flavors, cellulose gum, salt, sucralose, potassium sorbate (to preserve freshness), citric acid.